The drive toward Olympic, left as gazing at mile after mile of "managed" forests, and left us eager to once again see nature in it's original, natural state. Driving through areas that had been logged at one time or another the last 50 or so years reminded us of the importance of preserving areas of natural beauty through national or state parks. Once we reached Lake Quinault on the southwest corner of Olympic National Park, we suddenly realized we had reached the northwest corner of the United States. Sure we arrived a little early for tourist season, but the Lake seemed almost eerily devoid of other tourists or infrastructure. We ended up parking our ecamper at a trailhead since there weren't any campgrounds open yet. 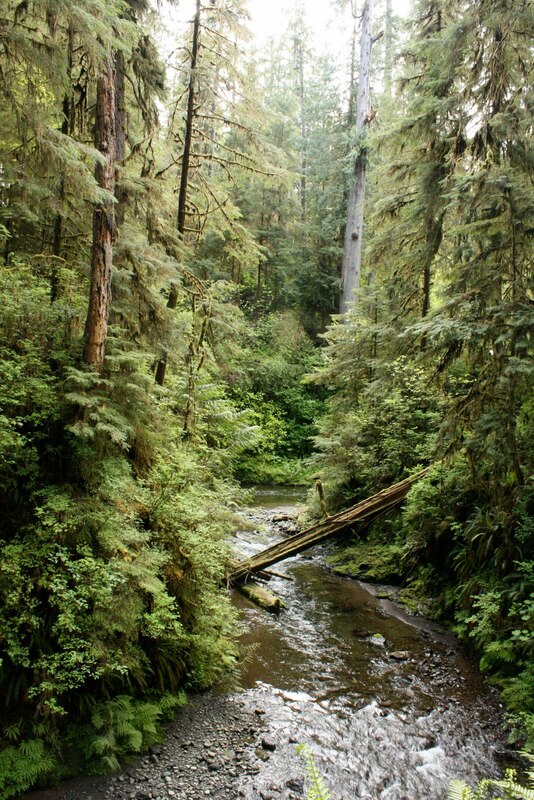 As it was, it wasn't a bad place to sleep, quiet and beautiful nestled among old growth spruce, ferns and mosses. The rain held off for a few hours in the morning and we were able to take a little hike through the rainforest and enjoy the sounds of cascades and birds, and experience the unique ecosystem up close. In contrast to California and Oregon, Washington doesn't have much of a coastal highway so only sporadically were we able to catch a glimpse of the Pacific. Despite being relatively short though, the drive along the coast differed from our earlier ventures in California and Oregon. Rocky, and rugged as before, but different. As we ate lunch at Ruby Beach looking, we again sensed that we were a long way from mainstream America. While we weren't alone, there was a feeling that those who had ventured this far had truly been on an adventure. As we wandered across the pebble beach, Elias and Frêney found rocks to stack, and sticks to play with. Logs washed up on the shore became boats as their fantasies guided them in this magical place. With sea stacks, and spruce, a quiet stream, and a whole lot of driftwood, this pebble beach turned into a playground of infinite dimensions. Even for us grown ups, it was easy to become kids again, looking among the rocks and logs for who knows what, or climbing on a sea stack in the low tide. Of all the beaches we had experienced on our travels north, this one had something a little more special. 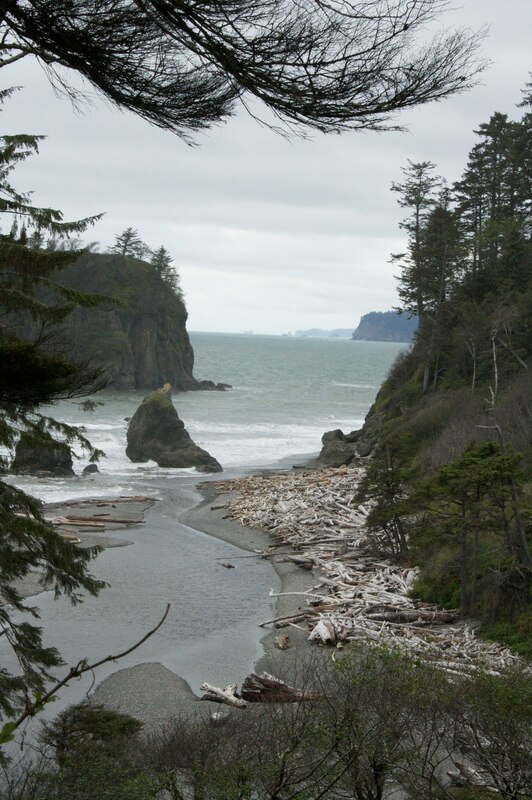 We wandered across the rocks, weathered and rounded by the surf, over logs washed up from near or far. With heavy clouds hanging over us, we tried to make a plan for the next day or two. Naturally, we wanted to see and experience more of Olympic National Park, particularly Hurricane Ridge with views over the Olympic Mountains. We stayed one more night, at Sol Duc, with a dip in the hot springs, before we gave up on seeing any more of the mountains and headed across the Juan De Fuca Strait to Canada.